I was born beside the Kettle Valley Railroad near Princeton, British Columbia, Canada in 1944. It was spring time and the Tulameen River was in flood and dad couldn't get mom to the hospital. I was in a hurry so I was born at home. 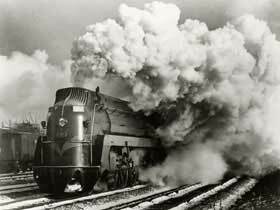 I have loved the sound of steam whistles ever since and I am still in a hurry. Audrey grew up beside the Kettle Valley Railroad-literally. Her parents had a small acreage with chickens, pigs and two milk cows east of town. But horses were the love of Audrey's life, from a very early age she begged and begged but her parents' had no money for something that didn't give back. The chickens provided the family of nine with eggs and meat. The pigs provided meat and the cows kept the family in milk, as well as an income from the sale of their calves. Audrey's love became an obsession and she often cajoled her younger brother into accompanying her to catch and ride any horse left out on the range behind their home. Without any riding gear they improvised with a length of rope tied around the horse's lower jaw. It was pure luck that neither of them ended up on the back of a totally unbroken horse, although a few times it was necessary to bail. Once they caught two horses from a herd of ten or more and were enjoying an afternoon racing around Baldy Mountain. Then the herd stampeded down a very steep slope. Halfway down Audrey's horse stumbled and she found herself on the horses' neck. It became quickly evident that at this rate the horse was going down and her with it. Audrey lifted one leg and let go of the rope and the horse disappeared down the steep slope-she hit the dirt sliding and watched as the rest of the herd and her younger brother raced past her head. Everyone survived without injury-but it took better than an hour to catch the horses to remove the ropes. Her mother never knew what really happened. Just a fall she was told when her ten year old daughter appeared for dinner, covered in dirt with clothes torn and hair snarled into a massive tangle that took ages to comb out. At age twelve Audrey went to work on a local ranch as a babysitter. By the end of that summer she was riding every day and went on to become a cowgirl. That was a wonderful time in her life. Horses, horses and more horses. Long days spent with only a horse for company. She found it fascinating to learn all about them-the nice calm ones, the high-strung nervous ones, the strong-willed stubborn ones and the ones that just didn't much care for people-at all. In her thirties Audrey finally bought her own horse. Finally, no parents, no husband, no more obstrutions to her greatest desire. Now in her seventies Audrey loves horses as much today as she did then. Her marvelous old horse, Buddy, passed away at the age of forty three. Now she shares her space with three Mastiffs. Sophia, Claire, Theo and a cat named Nut (for good reason).